As we head up the trail from the junction, the sound of water greets us. Soon crystal clear waters cascading down the rocks come into view on the right hand side. I’ve always found the sound of water comforting and even soothing while spending time in the great outdoors. This day is no exception. As we continue along the trail, it meanders back and forth alongside the creek. Soon the forest opens up, and rugged peaks appear above our heads. As we continue walking on a more level trail, a lovely alpine lake sits below Mt. Neva. We have reached our destination of Columbine Lake. I’ve heard Columbine Lake is aptly named for Colorado’s state flower — the very architectural blue and white Columbine. Though we have come too late for the Columbine, there are plenty of purple Aster, pink paintbrush and golden Aster in the meadows surrounding the lake. Columbine Lake makes for a great day hike, at less than 3.5 mile one way from the Junco Trailhead. But it is also a fine destination for a weekend backpack, to set up a base camp. You can easily backtrack the spur trail to the main trail and hike the steep and breathtaking Caribou Pass. Or if you are feeling adventurous, you can hike up to the ridge above Columbine and climb Mt. Neva. What I mostly enjoyed about our hike to Columbine Lake was the peacefulness and solitude. 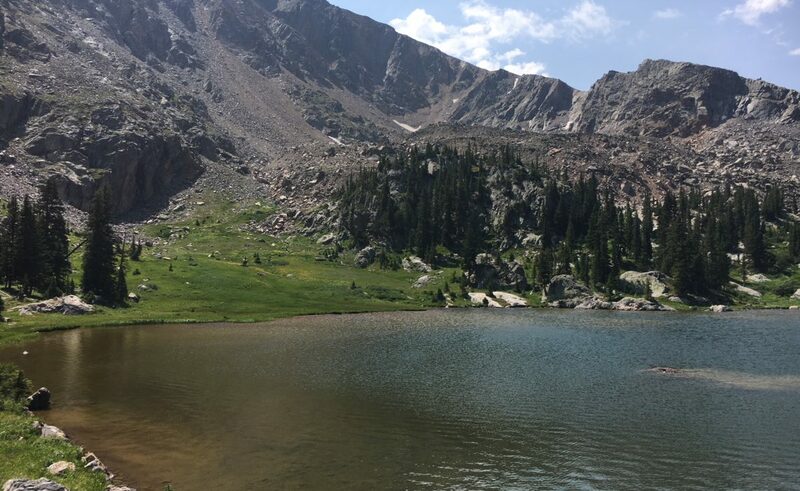 As anyone who lives on the Front Range knows, the popular trail heads in the Indian Peaks Wilderness on the east side have become “loved to death” during summer weekends. With hundreds of cars populating Fourth of July, Brainard and East Portal, you can sometimes lose the sense of wilderness. I don’t know about you, but the idea of wilderness for me includes quiet and solitude, something that can be hard to find at the trailheads in close proximity to Nederland. But if you are willing to take a bit of a drive before hiking, that sense of peace and serenity can still be found on the west side of the Continental Divide. It’s the same wilderness area, but with a fraction of the people, even on a weekend. To get to the Junco Trailhead, follow US 40 through Winter Park to Tabernash, going right on the road to Devil’s Thumb resort. Shortly after turning, fork left onto County Road 84, following it for 11 miles. From Boulder or Nederland, the drive is around two hours one way. In addition to the parking lot, there are restrooms and a cabin run by a Grand County volunteer group. The volunteers provide plenty of information and can even issue a wilderness permit for backpacking. We arrived at 8:30 a.m. on a Sunday to find plenty of parking. Contrast that with our east side trailheads where 8:30 is far too late to find anything except a “full” sign at Brainard Lake. Everyone we encountered just seemed more relaxed and happy to be outside on such a gorgeous day. Sometimes it’s good to expand your hiking boundaries to include a visit to the “wetter, better side”. You’ll remember what wilderness is all about….